New Study Shows A Grave Lack Of Gender Diversity In The Music Industry Among other findings, more than 90 percent of Grammy nominees in the past six years have been men. 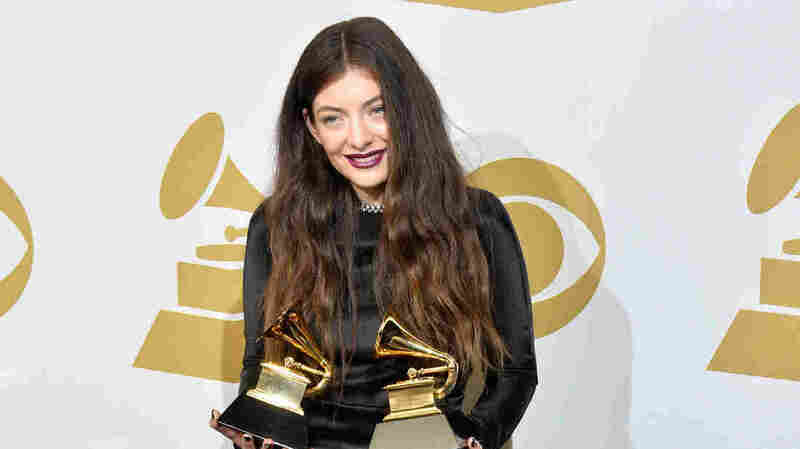 Lorde, seen here at the 2014 Grammy Awards, is the only woman nominated in this year's album of the year category. Ahead of Sunday night's 60th Grammy Awards ceremony, a new study published by University of Southern California's Annenberg Inclusion Initiative finds that more than 90 percent of Grammy nominees in the past six years have been male. Stacey Smith, co-author of the study — titled Inclusion in the Recording Studio? -- says there is an "epidemic of invisibility" in the music industry, particularly in songwriting and producing. "When it comes to songwriters, only 12 percent are female, and perhaps most egregiously, only 2 percent of 651 producers were women," Smith says. "And only two of those producers were women of color." The study wasn't only about the Grammys: Researchers also looked at the 600 most popular songs since 2012. The evidence suggests a heavily male-dominated industry overall — and when you consider that the music industry tends to favor the songwriters with a pedigree for churning out hits, that pool becomes even more shallow. "There are nine male songwriters that are setting the agenda for popular culture across a fifth of the most popular songs over the last six years," Smith says. "Nine men! I think consumers should know this, and I think there should be concern that such a narrow slice of humanity is responsible for and driving our ideas in music." "Any time you're in a room with a bunch of people who are considering hiring you, there is this immediate assumption, like, 'Who do you manage?' or 'Whose girlfriend are you?' ... They don't think of you as potentially a person who knows what they're doing," Kadry says. "And so you feel like you kind of have to prove yourself twice as much as males." Kadry says that the major labels, the hitmakers, rarely go outside their comfort zones in her experience — but sometimes their hands can be forced. "They usually go for their rolodex of the same dudes," she says. "I think when the artist has enough clout to be like, 'You know what? No. I want to work with this person,' then can the tides really change."